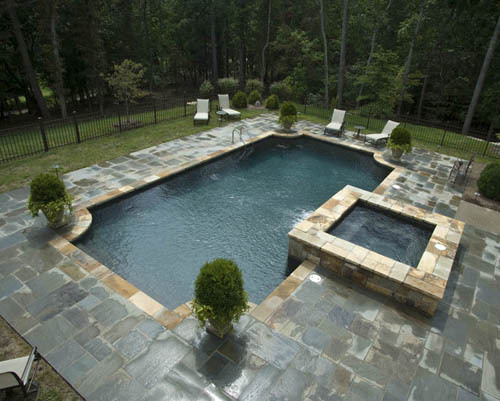 Summer is over and winter is settling in so why would you need poolside furniture buying tips? The main reason is that poolside furniture is less expensive now than in the height of summer, you can get “last year’s” models at a better price and if you’re looking for a gift for that hard to buy for person on your holiday shopping list, pool patio furniture might be just what you’re looking for! If you have a swimming pool, chances are you know you spend just as much time — if not more — poolside than you do in the pool itself. If you’re spending so much time poolside, you want to have furniture that is comfortable, durable and that will dry quickly enough that you’re not sitting in a waterlogged cushion every day! The swimming pool contractors from Tipton Pools in Knoxville, Tennesee also understand that just because the pool is closed, doesn’t mean you have to give up sitting outdoors or relaxing poolside — we still have some warmish days ahead! Having a well furnished deck means you can invest in a fire feature or space heaters and some warm, fuzzy blankets and still enjoy time outside with your family. No one wants to move their entire life indoors just because Labor Day has come and gone, right?! Look for furniture that offers an ambiance and a welcoming feel. No longer does every piece of furniture have to be a “matched set.” You can invest in pieces to mix and match that are in complementary styles and colors. Whether contemporary or modern, a central color theme and style pulls the whole poolside living area together. Choose from wrought iron, cypress, cedar or resin. Cedar and cypress can withstand the water your swimmers will be dripping. These woods age well and last decades. If you’re looking for an option that is a little less expensive choose aluminum frame furniture. This furniture can also stand up to years of use and weather, the same with resin furniture. When you’re talking about furniture consider which fabrics will withstand weather and exposure to chlorine-soaked bathing suits. Choose from vinyl, polyester and various cottons made specifically for outdoor use. Homes with children (or messy adults!) should choose fabrics that are easy to clean if foods and drinks are spilled! Choose from colors that lend a bright color splash reminiscent of a jungle or floral garden or choose something muted to give the space a subdued look and feel. Choose one vivid color (your favorite color) as a base and build the rest of your cushion colors around that in complementary tones. Before you make your furniture purchase, consider how many pieces you need and how they will fit into your existing poolside area. If you entertain a lot, make certain you get tables, storage chests as well as furniture. Shop today, then store the furniture away so it’s fresh and clean and ready for use next summer!